If we want tech to be more human, we’ll need to create awareness about privacy in the age of smart cities and IoT. That’s why we’re going to host a Game Jam about this subject, together with the Humboldt Institute for Internet and Society and INNOVATION & LAW. And you can apply. Private data is the number one resource of our time. It’s what gold and oil have been in the past centuries. Our user behavior – including the tiniest subconscious decisions we make when we use smart devices and browser interfaces – is a fine but steady load that’s been mined for many years now. To stick with this simple analogy: right now heavy machinery is invented to drill deeper. Thanks to the IoT the monitored behavior isn’t reduced to hardware we use deliberately. The whole city will become a computer. Sensors are going to be everywhere in the smart cities of the near future. And with great data comes great responsibility. We have to ask ourselves how we want to handle data protection and privacy in a society that seems to be dependent on progress by information. How can we establish awareness, not only among political activists and digital rights experts but people who engineer software, plan parking lots or open networks for the public benefit? For our partners Alexander von Humboldt Institute for Internet and Society and INNOVATION AND LAW, we’re going to host a Game Jam. The outcome we’re hoping for? Interactive and fun approaches on why data privacy and security is something we have to think of while developing a service or product. This awareness will have two effects: Privacy by design or privacy by default will become a standard for on the one side – and more trust in tech and progress on the other side. 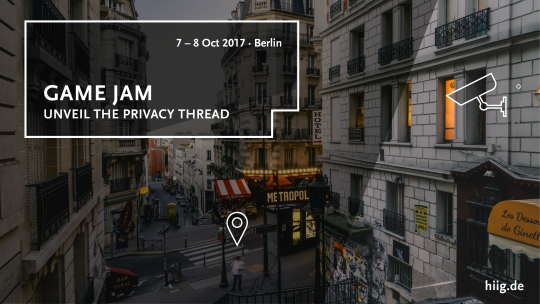 will take place on the weekend of 7-8 October at the premises of the Alexander von Humboldt Institute for Internet and Society in Berlin. There’ll be impulse talks by experts for inspiration and knowledge extension. Right now you can apply by simply writing an email to hi@booster-space.com. Please explain in two, three sentences why you apply / how you want to contribute.